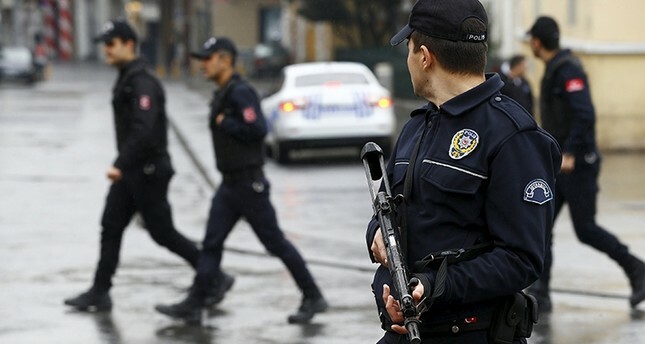 Police arrested at least 641 suspects on Tuesday, one day after Interior Minister Süleyman Soylu announced that they were preparing for "a big operation" against the Gülenist Terror Group (FETÖ). Detention warrants have been issued for 1,112 suspects as part of an extensive probe on exam fraud by members of the Gülenist Terror Group (FETÖ), reports said Tuesday. Carried out in 76 provinces throughout Turkey, the operation was launched by Ankara Prosecutor's Office and focuses on the fraud committed by FETÖ members during a deputy police chief entry exam in 2010. The suspects are accused of accessing the answers to the exam and distributing them among FETÖ members for mass cheating. Media reports claimed that an acting police chief of a central Turkish town was also among those arrested. The exam allows policemen to be promoted to the rank of deputy inspector, the first step for promotion in a law enforcement career for many. The terrorist group, known for its widespread infiltration of law enforcement, bureaucracy, military and judiciary, moved to seize power three times, twice in 2013 and with a coup attempt in 2016. Its bloodiest attempt was on July 15, 2016, when military officers linked to the group killed 251 people opposing the attempt. Since then, thousands of people were detained or arrested for links to FETÖ and dozens were sentenced to life for the coup attempt. Earlier investigations have revealed that between 2009 and 2014 - the year it was designated as a national security threat - FETÖ stole questions and answers to exams for academic promotion, for the public sector as well as for rank promotions in law enforcement, judiciary and bureaucracy. The group then supplied it to its members, effectively running an infiltration scheme to further its clout, dating back to the 1980s. Several members of the terrorist group were already convicted of mass cheating on a nationwide exam for civil servants. Multiple investigations into the group's methods for cheating found that FETÖ leaked questions and answers to young members, either handpicked by the group's leaders or eager to join the public sector. Former members of the group had testified in other cases that "brothers" or "imams," point men and handlers for FETÖ, provided them questions and answers to exams. Civilians are believed to have gained access to well-protected questions and answers through infiltrators in bodies tasked with organizing the exams. The Ankara Chief Prosecutor's Office has launched investigations against the police exam cheating after the 2016 coup attempt. It had already issued arrest warrants for dozens of suspects, but yesterday's operations were among the biggest against FETÖ to date. A total of 1,112 suspects were identified when all of them gave the same answers to the same 13 questions whose answers were actually misprinted, demonstrating that they had memorized the questions and answers beforehand. Their names also matched a database of Gülenist police officers found in possession of a former FETÖ member who confessed his ties to the terrorist group. The database contains names and information on police officers who were planted in law enforcement by the terrorist group. The Public Personnel Selection Exam (KPSS) in 2010 was canceled years later after it was found that FETÖ had supplied the questions to hundreds of its followers. Civil servants who passed the exam have faced investigations. In 2017, security forces detained 10 suspects for fraud in the entrance examination for a prestigious Police Academy in 2009. The terrorist group faced more scrutiny after the coup attempt, which was its first attempt at using its adherents in the military to seize power, just three years after it had tried its hand at a coup through its infiltrators in the judiciary and law enforcement. More than 100,000 people have been arrested or detained since the failed coup attempt with a similar number having been dismissed from their public sector jobs for links to the terrorist group.